Employment edged up by 26,000 in May, driven by gains in part-time work. The unemployment rate increased 0.1 percentage points to 7.0% as there were more people in the labour market. Overall employment growth has been subdued since August 2013. In the 12 months to May, employment increased by 86,000 or 0.5%, with all the growth in part time. Over the same period, the number of hours worked was little changed. There were more employed men and women aged 15 to 24 in May. However, this was partly offset by fewer employed men aged 25 to 54. Provincially, employment increased in Alberta, while it declined in Newfoundland and Labrador. There was little overall employment change in all other provinces. There were more people working in educational services, accommodation and food services, and in agriculture. At the same time, there were fewer people working in natural resources, as well as in finance, insurance, real estate and leasing. The number of public sector employees increased in May, mainly the result of more employment in educational services. At the same time, there was little change in the number of private sector employees and a decline in self-employment. On a year-over-year basis, all of the employment growth was in the private sector (+129,000 or +1.1%), while there was little change in the public sector and in self-employment. The number of youths aged 15 to 24 who were working increased by 49,000, bringing their employment to a level similar to that of May 2013. The youth unemployment rate was 13.3%, little changed from the previous month and from 12 months earlier. Employment among men aged 25 to 54 declined by 23,000 in May. 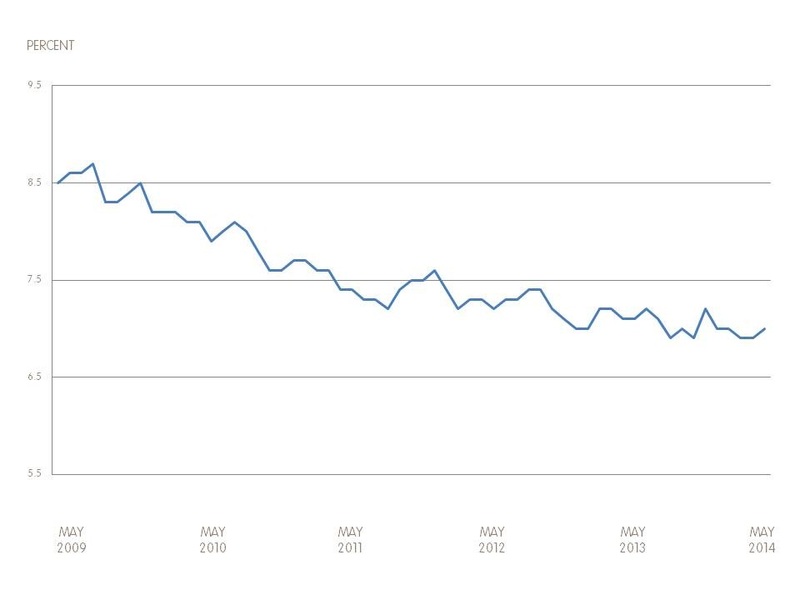 The employment trend for men in this age group has been flat since January 2013. While employment was unchanged for people 55 and over in May, it was up by 109,000 (+3.2%) compared with 12 months earlier. All of these gains were the result of population growth in this age group. In Alberta, employment increased by 16,000 in May and the unemployment rate was 4.6%. This latest employment increase contributed to year-over-year gains of 71,000 or 3.2%, the highest growth rate of all provinces. Employment in Newfoundland and Labrador declined for the second consecutive month, down 4,100 in May, pushing the unemployment rate up 0.6 percentage points to 12.7%. Compared with 12 months earlier, employment in the province was down 8,900 or 3.8%, the result of declines since the start of 2014. In Ontario, employment was little changed, leaving employment in the province 39,000 (+0.6%) above the level of May 2013. The unemployment rate was 7.3% in May, the same rate as 12 months earlier. While employment in Quebec was unchanged in May, there were more people searching for work, pushing the unemployment rate up 0.4 percentage points to 8.0%. On a year-over-year basis, employment in the province was little changed. Employment increased by 22,000 in educational services in May, but was little changed from 12 months earlier. Employment rose by 20,000 in accommodation and food services, offsetting some of the declines in April. Employment also increased in agriculture, up 19,000. 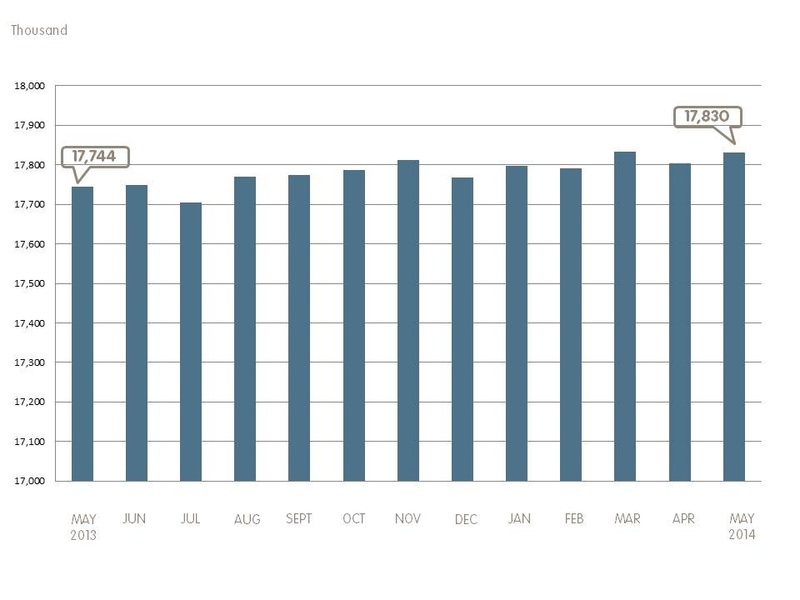 Despite this gain, employment in the industry was little changed compared with 12 months earlier. The number of people working in natural resources declined by 23,000 in May, bringing employment in the industry back to about the same level as in May 2013. There were 21,000 fewer workers in finance, insurance, real estate and leasing in May, the third decrease in four months. The recent losses contributed to a year-over-year employment decline of 33,000 (-2.9%) in the industry. From May to August, the Labour Force Survey collects labour market data about youths aged 15 to 24 who were attending school full time in March and who intend to return to school full time in the fall. The May survey results provide the first indicators of the summer job market, especially for students aged 20 to 24, as many students aged 15 to 19 are still in school. The data for June, July and August will provide further insight into the summer job market. The published data are not seasonally adjusted, and therefore comparisons can only be made from one year to another. The employment rate among returning students aged 20 to 24, that is, the number of employed as a percentage of their population was 59.5% in May, similar to that of 12 months earlier. The unemployment rate for this group of students was 14.4% in May, little changed from May 2013.